Scott Miller performs the classic Roger Miller “Old Toy Trains” on his latest offering, “Christmas Gift” EP. I dedicate this to all of you who ever wished your son would be happy if he had gotten a little toy train..I’ll tell you the truth.. I think I’d like one of those this year.. Thanks Glen Campbell for introducing me to this beautiful, emotional and underappreciated Christmas song when I was a boy who idolized you and wanted to play guitar because you did.. Merry Christmas Glen.. Merry Christmas To All.. 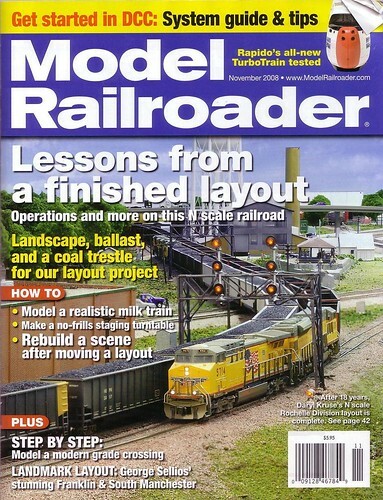 I almost fell over when I saw this…the Rochelle Railroad Park on the cover of the November issue of Model Railroader magazine! Model railroader Daryl Kruse built an N scale version of the Rochelle Railroad Park on his "Rochelle Subdivision" model train layout. Go out and get your copy of MR today, where ever fine railroad magazines are sold.